Huh. The eight items listed by these experts include breakfast cereal, ground coffee, flour, milk, eggs, produce, spices, and condiments. 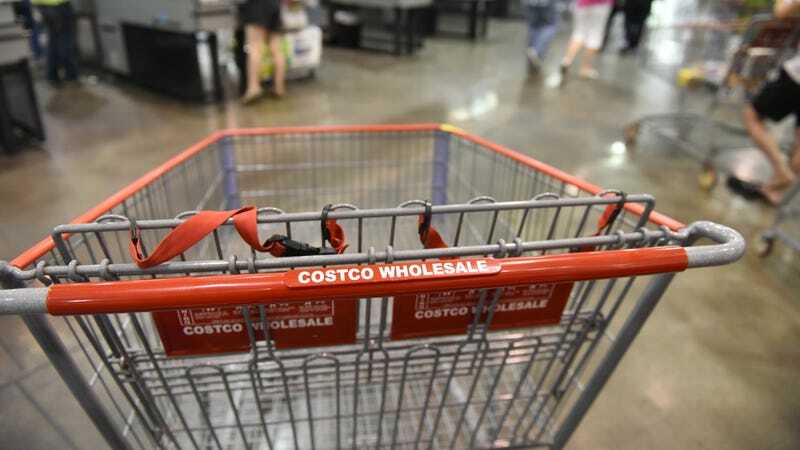 The reasoning, says CNBC, is that “The containers or packages are simply too big to end up being a good value for the average person.” The expert, Charlene Haugsven, founder of MyFrugalAdventures.com, says that Costco large quantities can be tough to store. You might find better prices on items like milk or eggs at your local grocer. And the single person or average-size family might have a hard time getting through large boxes and cans before the item inside goes stale. Fair points, but we believe this list is flawed. Like many lists, this one is subjective. I have an absolutely nuclear family (two parents, two kids—a boy and a girl), and we have no trouble getting though that ginormous pack of Honey-Nut Cheerios, or the large container of strawberries in a few days. But I find the two-pack of two-gallon Kirkland milk jugs downright oppressive, while another family would probably have no trouble polishing all of that off before it goes bad. I do agree that bulk spices are not the best idea, as they tend to lose flavor over time, so by the time you get to the oregano at the bottom of the jar, you may be sprinkling something that just tastes like solid air. But soy sauce lasts practically forever, so if you have room in your pantry, why not purchase? That said, there are other things I would avoid even at my beloved Costco. My husband can’t seem to resist those 24-packs of little cans of tomato sauce, which absolutely haunt my kitchen. Takeout editor Kevin Pang currently hosts a 22 oz. container of Costco pesto that’s been sitting in his fridge since August, and Eat By Date (a helpful site to bookmark) says jarred pesto should last no longer than two weeks in the fridge. Who goes through nearly three cups of pesto in two weeks? And huge bags of chips are just going to get really messy and crumby by the time we’re done with them, unless we’re throwing a party. Still, there’s still enough there to make my infrequent Costco visits worthwhile—and sometimes we even double up on the Nutella.